Red Rock National Conservation Area is 15 miles from the Strip—its peaks poke from the horizon between Caesar’s Palace and the Mirage—but few visitors to Las Vegas ever glimpse its burnished outcrops, let alone probe its oracular beauty. It rises abruptly from the Mojave, truly as red as its name, and copper, and pink, and every variety of orange—blood orange, navel, Valencia, tangerine. Water still runs in its gullies, oozes from crevasses in the rock. Petroglyphs, the rock art of the ancients, are carved throughout the 10,000 acres, the location of the symbols mostly kept secret. Paleo-Indians left the earliest human trace around 11,000 B.C. The dinosaur prints date to about 190,000,000 years ago. I come in 2012, but I don’t go to the main visitor’s site—I take a right off of State Route 159 toward Calico Basin, past the horses corralled on one side of the road, the herd of goats penned on the other, through a desultory collection of homes and ranches to the state-of-the-art picnic area where climbing rangers hang out near vans stocked with harnesses and ascenders, and all variety of rescue gear. Two bodies were pulled from Red Rock last month—a middle-aged hiker who fell hundreds of feet, and a young rapeller who fell a few score. I am headed for Kraft Boulder Peak, which rises to just under 1000 feet, puny in comparison to its fellows—giants who hulk through the clouds and sometimes wear snow on their summits. The path from the parking lot edges a wide wash at the base of the adjacent mountain. Chunks of jumbled stone pile one upon the other, all shapes and sizes, some as large as a single-family dwelling, others the size of SUVs and foot lockers, and all of them made from Aztec sandstone, hardened on the hinge of the Triassic and Jurassic about 220 million years ago. The remnant of one of the largest deserts in Earth’s history, Red Rock sandstone exhibits a curious feature—an intricately textured surface, caused by countless shifts in ancient, mile-high, dunes. First it blew one way, then another, hardening with heat and pressure, to-ing and fro-ing, leaving traces of the layering behind. Erosion continued the inscription over the millenia, etching fine lines and erasing others. The result is a kind of mountainous calligraphy, a cladding of epic proportions. At Cannibal Boulder, I greet a group of climbers coiling ropes who tell me they’re from Cornell. While there are four mapped routes up the Cannibal, there’s no distinctive path up Kraft Boulder Peak. You simply step, lift, squeeze, and pull yourself up from stone to stone as fancy dictates, opting for the easier routes perhaps, perhaps scrambling on all fours. Like all mountains, a curious inversion of distance occurs, so what seemed close is actually further away, and the peak appears to recede the higher you climb, a red carrot against the aqua Nevada sky. To the south, I see two guys making reasonable progress, descending by following a diagonal chute, a kind of hidden fold in the mountain. I wonder if they made it to the top. A short while later, I come across a Japanese couple, hats firmly tied under their chins, resting on a bronzed outcrop. “Very good,” the man says. The woman just smiles. Soon I reach an area where my senses swoon, where the textures on the rocks, the crossbedding of the sandstone combined with oxidation and erosion, have created an encyclopedia of pattern, a veritable compendium of glyph. Some stones appear to have been batiked, others tie-dyed, others stippled with points of red against a lighter ground, reams of mineral polka dots. Further up, the Morse Code begins, and past that, remnants of ancient alphabets carpet the mountainside. I pause next to something that looks like Aramaic. Even though I know these marks are not man-made, they seem as if they should be. Their beauty is so great, their lines so measured and intricate, they look more like ruins from than ancient world than haphazard geological features. They babel in my wake. Nearer the top, the pathways become a little tricky—the height of the vertical faces increases to the point that the balance tips between safety and risk. Some hikers turn back, just when the summit is within reach. I have, too. But that was before I came across a mom and an eight-year-old who had made it to the peak. “There’s doable ways up,” she said. “Just keep looking.” Today, I find passage, seat myself on a companionable lump on the top, the casinos of Las Vegas specks on the horizon. On the other side of Calico Basin, I can see the 13-mile scenic drive following the rim of the mountains, some of the canyons filled with petrified wood. There are troves of fossils somewhere down there, too—but the exact locations are mysterious, blacked-out on the PDFs. In the panorama of summits and canyons, my eye lingers often on the spectacular vestige of the Keystone Thrust, the tectonic dosey-doe in which gray Cambrian limestone—formed when Utah was the West Coast—pushed up over the much younger pink Jurassic sandstone. 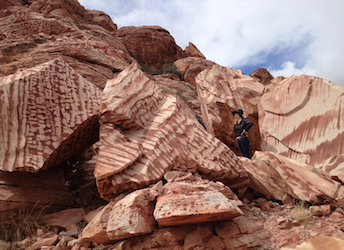 In other words, stones that hardened when Red Rock was submerged beneath soupy waves now glisten along the ridge. I wish I could decode every nook and cranny, every mark and pock. But the language is alien, enigmatic, written in the majestic sweep of eons. * Thumbnail photo by mountainrockdhh. Thanks to Sally Fischer for the (discreet) photo of the author amid boulders. This entry was posted in Nature and tagged alphabets, boulder, Calico Basin, Cambrian, casino, desert, dinosaur, dunes, fossils, glyph, hike, hikers, history, Jurassic, Keystone Thrust, language, limestone, Mojave, nature, petroglyphs, Red Rock, rock, rock climbing, sandstone, stone, Strip, summit, Vegas. Bookmark the permalink. thats a terrific photo of the rocks and you.